Ontario Harvestore sets the standard for feed quality, providing an efficient, first-in first-out feed storage and delivery system. Offering a turn-key solution, Ontario Harvestore is a company built for a lifetime of satisfaction.It all started over 70 years ago when Harvestore revolutionized livestock feed with the invention of Harvestore glass-fused-to-steel silos to better store high moisture corn and foliage. People were amazed at the system and are still amazed at the system at how well the silos have stood the test of time.Then came Slurrystore glass-fused-to-steel manure storage systems. 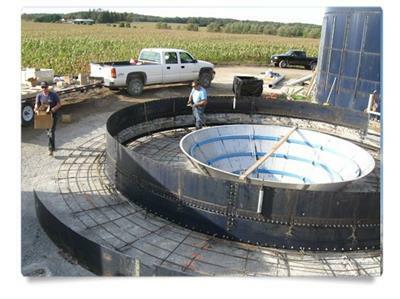 Leveraging the success of applying glass-fused-to-steel success in the water storage market, Slurrystore tanks have become the best solution for environmental stewardship and economic manure management. Then came Slurrystore glass-fused-to-steel manure storage systems. Leveraging the success of applying glass-fused-to-steel success in the water storage market, Slurrystore tanks have become the best solution for environmental stewardship and economic manure management. The XL600 HD unloader is the most powerful, fastest and most efficient unloader. It meets and exceeds the demands of modern farming systems. It was designed to be the fastest unloading system compared to the perceived unloading speeds of bags and bunkers. With over 26 years experience, designing, assembling and servicing quality feed storage structures and equipment, Ontario Harvestore Systems has become an expert in understanding the needs of today's farmers.